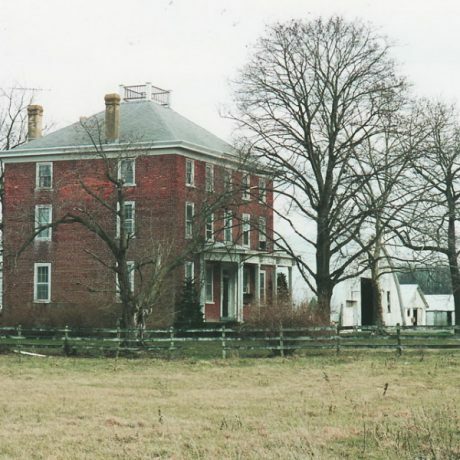 This three-story brick house was built in 1864 for the Joseph R. Hackett family, owners of a large farm. It is an important local example of the home of a mid nineteenth-century prosperous farmer. It stands in an agricultural area of more than 2000 acres that the Salem County Agricultural Development Board is in the process of acquiring in cooperation with the Garden State Preservation Trust. After Salem County acquires the Hackett-Strang farm it plans to auction it to a new owner who will be required to maintain the farm in agriculture. But even though an easement will be placed on the land prohibiting its non-agricultural use, no equivalent requirement to retain the historic home at its center will be made. This placing of restrictions on the land but not on the building means that farmland preservation will leave the Hackett-Strang house unprotected from demolition in the future. It is a situation that faces historic farmsteads all over the state. As New Jersey acquires farmland acreage at accelerated rates, this uncertain fate will be shared by many other historic farmhouses, barns, and outbuildings. Mid-eighteenth century intact farm to be purchased through the Farmland Preservation Program’s fee simple program with easement on land. One week after our 10 Most Announcement, the State Ag Development Committee agreed to protect the house as well as the acreage. House now has preservation easement on the façade being held by SHPO. Farm was sold at auction with easement on house.